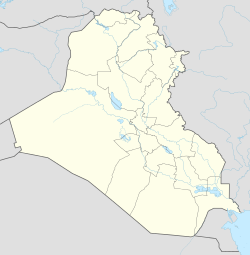 H-3 Air Base (code-named 202C, 202D) is part of a cluster of former Iraqi Air Force bases in the Al-Anbar Governorate of Iraq. H3 is located in a remote stretch of Iraq's western desert, about 435 kilometers from Baghdad in western Iraq. It is close to the Syrian–Iraqi border, and near the highway that connects Jordan with Baghdad. H-3 Main is supported by two dispersal airfields, H-3 Southwest 32°44′48″N 039°35′59″E﻿ / ﻿32.74667°N 39.59972°E﻿ / 32.74667; 39.59972﻿ (H-3 Southwest AB), and H-3 Northwest 33°04′34″N 039°35′52″E﻿ / ﻿33.07611°N 39.59778°E﻿ / 33.07611; 39.59778﻿ (H-3 Northwest AB), and a Highway strip, 42 kilometers to the west 32°50′55″N 039°18′28″E﻿ / ﻿32.84861°N 39.30778°E﻿ / 32.84861; 39.30778﻿ (H-3 Highway Strip). H-3 Southwest is served by a single 9,700 foot runway and has a parallel taxiway that could be used as an alternate runway. The complex was one of eight major operating bases of the Iraqi Air Force prior to the 2003 invasion of Iraq by Coalition forces. It was later de-militarized by the Coalition and today is abandoned. H-3 airstrip was established by the Iraq Petroleum Company in 1935 as a landing ground for pumping station H3 on the Mosul–Haifa oil pipeline. It was never a British Royal Air Force (RAF) air base although during World War II the pumping station and adjacent oil pipeline were patrolled by RAF Armoured Cars, together with RAF Iraq Levies based at H3 and RAF aircraft would have used the airstrip. During the 1970s, it was one of several Iraqi airfields upgraded under project "Super-Base" in response to the experiences from Arab-Israeli wars in 1967 and 1973. Companies from Yugoslavia – previously engaged in building bridges in Iraq – became involved in airfield construction. Due to their specific construction of these airfields – which included taxi-ways leading right out of Hardened Aircraft Shelters (HAS) and laid diagonally to the runways – they became known as "Trapezoids" or "Yugos". The protection of each HAS consisted of one meter thick concrete shells, reinforced by 30 cm thick steel plates. There was only one entrance and this was covered by sliding doors, made of 50 cm thick steel armoured plate and concrete. The HAS' were usually built in small groups – seldom more than five, with each group sharing the same water and power supply, besides having own backup gasoline-powered electrical generator, and each HAS being equipped with a semi-automatic aircraft-refueling system. During the winter of 1980–1981, Iraqi Air Force kept back its military airplanes in H-3 base to protect them from Iranian Air Force Attacks. So the Iranian decided to hit there. On 4 April 1981, eight IRIAF F-4 Phantoms flew their boldest interdiction strike of the war, penetrating over 1,000 km into Iraq in order to attack all three airfields of the H-3 complex. Achieving complete surprise, the Iranians made several passes against Al-Walid, H-3 Northwest and H-3 Southwest ABs, destroying three AN-12s, one Tu-16, four MiG-21s, five Su-20/-22s, eight Mig-23s, and two Mirage F-1EQs (delivered only weeks earlier), as well as damaging eleven others beyond repair, including two Tu-16 bombers. Two Iraqi pilots and fourteen personnel were killed, together with three Egyptian and an East German officer, while 19 Iraqis, four Egyptians, and two Jordanians were badly injured. This strike considerably degraded Iraq's capability to retaliate. Chemical weapons were stored at the H-3 airfield (main) during Operation Desert Storm in 1991 according to declassified U.S. intelligence reports which describe Iraqi efforts to disperse chemical weapons by truck to other locations. The S-shaped bunker located at H-3 airfield (main) and the four at the H-3 ammunition storage facility were damaged or destroyed during Desert Storm. Of the 22 S-shaped bunkers located across Iraq, 10 had been destroyed as of 8 February 1991. It is not known whether the rest were subsequently destroyed. On 18 March 2003, B and D Squadrons of the British 22nd SAS Regiment infiltrated Iraq along with 1 Squadron Australian SASR and headed for H-2 and H-3 Air Base. They set up observation posts and called in airstrikes that defeated the Iraqi defenders. H-3 airbase was defended by a battalion of Iraqi troops and significant numbers of mobile and static anti aircraft guns, the British and Australian SAS were joined by members of Delta Force and on 24 March by Green Beret ODAs from Bravo company, 1st Battalion 5th SFG, together they called in constant 24 hours of precision airstrikes on H-3 forcing the Iraqi defenders to flee, the Coalition SOF secured H-3 and seized around 80 assorted anti aircraft cannon guns and an enormous amount of ammunition. A company of Rangers and Royal Marines from 45 Commando flew from Jordan to reinforce the air bases, the Coalition SOF handed the bases over to their control and proceeded with their other missions. Current aerial imagery shows that the operational structures around the airfield and its three auxiliary airfields appear to be largely intact. The taxiways at the airfields remain exposed to the elements. The use of runways is interdicted by a series of obstacles, including unusable airframes. ^ Cooper, Tom; Bishop, Farzad (2000). Iran-Iraq War in the Air, 1980–1988. Atglen, Pennsylvania: Schiffer Military History. pp. 248–249. ISBN 0764316699. LCCN 2002110491. Wikimedia Commons has media related to H-3 Airbase. Warwick, Nigel W. M. (2014). IN EVERY PLACE: The RAF Armoured Cars in the Middle East 1921–1953. Rushden, Northamptonshire, England: Forces & Corporate Publishing Ltd. p. 664. ISBN 978-0-9574725-2-5.